Congratulations to "Trude V.", the winner in Kim's giveaway. Thank you to all who participated! Often, the first chance you get as an author to gain a reader is that initial glance a reader has towards your book cover. A bad cover is like showing up at Fashion Week in mom jeans and a sweatshirt. By bad cover, I mean homemade looking and don’t tell me you can’t see the difference. Covers that come out of a New York publishing house have that special something that a self-made cover doesn’t usually have. Different genres (Suspense, Women’s Fiction, Fantasy, Romance) have different looks to their book covers and an author must try to portray their genre and their promise correctly for that first glance. If you don’t, you might wind up with readers making poor choices and that usually means bad reviews. Promises are important. In the cover below, you are being promised not only that there will be wildlife involved but the hero is a hunk and there is probably going to be some kissing inside the pages. The font even promises that the story will be straight forward and no-nonsense. In this day and age of Paranormal, we can assume this hunky hero turns into a bear and someone falls in love with him. That’s the promise. My dilemma is that I’m not sure what to promise my readers. I drive myself crazy thinking about this. I write cross-genre and can go many different ways with a cover. Suspense/Thriller covers are pretty straight forward as are Romance, as are Paranormal but it’s hard for me to know which way to go because my books encompass all three. And, my Paranormal aspects are what I believe are almost normal and I don’t want to mislead those readers who like Vampires and Shapeshifters. My Paranormal is Supernatural, almost Magical Realism. I wake up in a sweat wondering if I should lean on the Paranormal aspect in my stories and put a ghost on the cover, or go full Suspense and put a weapon lying on a black background. There is always some Romance in my stories too so then I wonder if I should use an embracing couple, or at least a person who looks like they’d appreciate some love in their life. I added more printing as time went on and the book won awards and garnered wonderful editorial reviews. Because reviews mention they didn't think they'd like this paranormal book, have never read Paranormal, don't usually try a book with Paranormal aspects etc, I took out the word Paranormal in the title on Amazon. 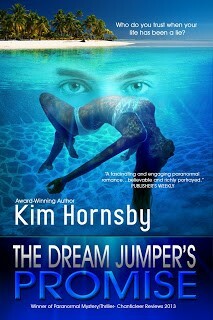 Then, I decided that the cover for THE DREAM JUMPER’S PROMISE, (which I adore,) might do well in the Suspense/Thriller genre if I made a new cover. Lately, I've been reading suspense books with the word GIRL in the title, maybe because I really enjoyed Gone Girl. Most of my choices of late have black covers. Many of them have very simple conceptual designs, like Gone Girl's second cover-- blonde hair disappearing off the page. I decided to try to market to Suspense/Thriller readers who might not otherwise try a Paranormal novel. The best way to do this is by changing my book covers. For all three DREAM JUMPER books. Rather than spending hundreds more dollars with a cover artist, I decided to do the covers myself. Risky, yes, but I knew what I wanted, have access to Pic Monkey, and was pretty sure I could manage the three-book cover designs if I kept everything very simple. I chose three stunning photos from iStock Photos that in some way conceptually reflect the essence of each story and made the book covers. It was painful to leave my gorgeous covers behind and try a new idea that I'm not sure will pay off but I pushed SEND and waited for KDP to upload the new covers. Tina Greene's husband has gone missing while surfing off Maui with little hope of a recovered body. She pulls herself from the wreckage of her life to rescue her failing dive shop from bankruptcy. When an old lover walks in the shop after ten years, she panics to see Jamey Dunn again. His promises once meant everything to her, then he disappeared suddenly from her life. Jamey Dunn has spent a lifetime adjusting to what he's termed heightened intuition. That, and being able to enter people's dreams. When he discovers Tina is still on Maui, he's distraught to find her a shell of the person he once loved. And he might be responsible. Compelled to help her, Jamey learns that Tina's otherworldly dreams are part of her problem and he might be the only person who can help her make sense of them. But when he reveals his secret ability to enter dreams and offers to enter her sub-conscious, she doesn't trust him. Working to gain her trust, Jamey knows he has to solve this mystery for Tina to absolve him in the key role he played in the ruin of her life. From Maui to Seattle to Afghanistan and into the mysterious dream world, Jamey must keep Tina from his worst nightmare, regardless of the outcome. Jamey Dunn has always been able to enter people's dreams. Until recently when he unknowingly passed the ability to Tina Greene, a former girlfriend who owns a dive shop on Maui. She doesn't want it. But she wants Jamey and has to accept all that comes with this soldier on leave from Afghanistan. And that means secrets. Secrets that he must keep to insure Tina's safety. When he's called home to Seattle, she suspects he's headed back to war. She's been left before, and double-crossed by someone she loved. But when the military comes for Jamey, life takes a strange turn and because of their shared ability to enter dreams, a series of events occurs that has them trying to save the other's lives in dire circumstances. Jamey Dunn and Tina Greene take to the road on a manhunt to flush out a child abductor who’s taken a seven-year-old boy near and dear to their hearts. With their dreams offering sketchy clues, the twosome venture into Mexico to find the boy. When dreams become premonitions, Tina and Jamey close in on the criminals but narrowly miss an opportunity to end this ordeal. Clues lead them to an exotic country where a horrifying nightmare reveals a preventable accident that ends in death. It must be prevented. At any cost. Tina and Jamey soon find themselves scrambling to save three lives, but which one first? Incidents separated by miles has Tina tormented to choose and her bravery is put to the ultimate test to rescue those she loves. But she can’t save Jamey from his past and they soon discover that turning over rocks has its price. And dreaming can be murderous. I won’t pretend it isn’t scary and that I don’t have doubts but I feel that they represent the stories well. Time will tell if it translates into sales. Fingers are crossed. 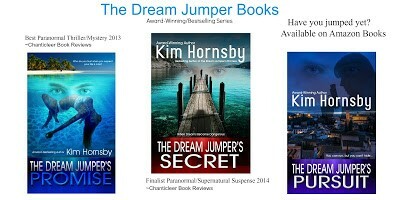 I will be giving away a copy of the entire DREAM JUMPER SERIES in ebook form to someone who comments or leaves an email entry. Giveaway ends 11:59pm EST Feb. 17th. Please supply your email in the post. You may use spaces or full text for security. (ex. jsmith at gmail dot com) If you do not wish to supply your email, or have trouble posting, please email maureen@justromanticsuspense.com with a subject title of JRS GIVEAWAY to be entered in the current giveaway. Oooooh... I really like the new covers :) congrats on your series and thanks for sharing! This series looks great, as do the covers. Thanks for the chance. YOu are most welcome, Laura. I really like the new covers! Going to have to try this series!! Excellent! Thanks so much Janice. I do like the new covers. I hope it does translate into sales for you. It's worth a try, right? Thanks Mary. The new covers look great, Kim. Congratulations! Glad you like them, Janet!